The white-cheeked barbet (Psilopogon viridis) aka small green barbet belongs to the family Megalaimidae. The white-cheeked barbet species are endemic to the forest areas of the Western Ghats and adjoining hills in southern India. This barbet species has a distinctive whitish supercilium and a broad cheek stripe below the eye. These barbets are monotypic species. The white-cheeked barbet (Psilopogon viridis) is a small green barbet, measuring 20 to 25 cm in length and weighing 70 to 90 grams. The white-cheeked barbet has a distinctive whitish supercilium and a broad whitish cheek stripe below the eye. It has brown head with whitish streaking. The neck, nape and breast are brown with whitish streaking. The upperparts, wings and the tail are green. The chin and throat are whitish. The belly, vent region, undertail coverts are pale green. The undertail is pale blue. The bill of the white-cheeked barbet is pale pink and is fringed with bristles. The irises are dark brown. The eye-ring and the bare skin around the eyes are gray. The feet are pale gray. Their call is a rapid "kokoa..kokoa..kokoa" sound. These white-cheeked barbet species are endemic to the forest areas of the Western Ghats and adjoining hills in southern India. These white-cheeked barbet species are distributed in the states of Tamil Nadu, Kerala, Karnataka, Goa, Maharashtra and Gujarat. These white-cheeked barbet species have moderate forest dependence. They normally occur in altitudes from 0 to 1800 meters. Their artificial ecosystems and habitats include rural gardens, orchards, urban areas and plantations. The natural ecosystems and habitats of these white-cheeked barbet species include tropical and subtropical dry forests, tropical and subtropical moist lowland forests, evergreen forests and moist montane forests. The diet of white-cheeked barbet consists mainly of fruits. Wild fruits, figs, cultivated fruits, berries are their primary food. These species occasionally eat insects. 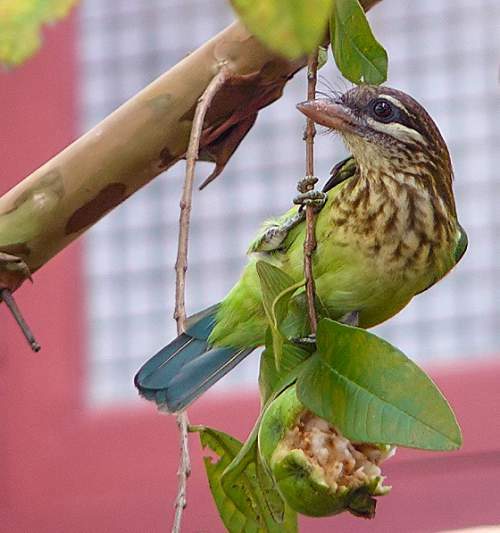 These white-cheeked barbet are known to raid orchards, fruit plantations, rural gardens and urban fruit trees, causing considerable damage to the fruit crops. The breeding season of the white-cheeked barbet species is from December to June, before heavy monsoon rains. Usually two broods are raised in a year. They are monogamous and territorial. The nesting sites of these barbet species include old branches in the trees. Both of the pair take part in excavating nesting cavities. They prefer gulmohur (Delonix regia) and African tulip (Spathodea campanulata) for excavating nests. The clutch may contain two to four eggs. Both the parents take turns to incubate the eggs in the day. Only the female incubates in the night. The chicks hatch out after 13-14 days. Both the parents feed and protect the chicks till they fledge by the sixth week. These white-cheeked barbet species are non-migratory, resident birds. The birds in higher altitudes move to lower levels and plains during winter. The global population size of the white-cheeked barbet (Psilopogon viridis) has not been quantified. The overall population trend of these species is considered to be stable. Throughout its range, this white-cheeked barbet species is reported to be reasonably common. The generation length is 8.5 years. Its distribution size is about 383,000 sq.km. Habitat alteration and destruction, deforestation and capture for pet-trade are the main threats that may endanger the survival of these species. 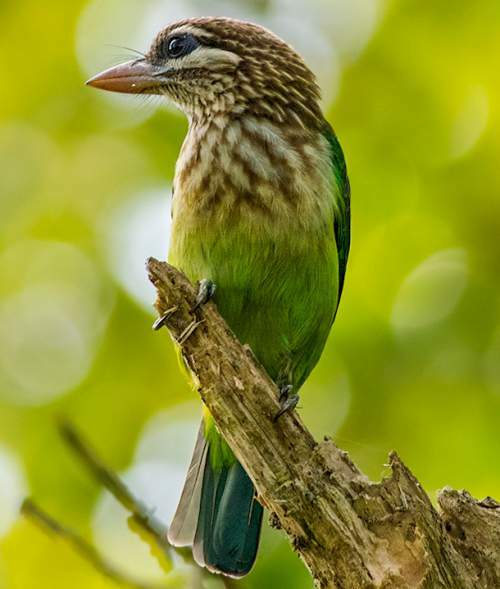 The white-cheeked barbet (Psilopogon viridis) does not approach the thresholds for being Vulnerable either under the range size criterion, or under the population trend criterion or under the population size criterion. The IUCN (International Union for Conservation of Nature) has categorized and evaluated the white-cheeked barbet species and has listed it as of "Least Concern". 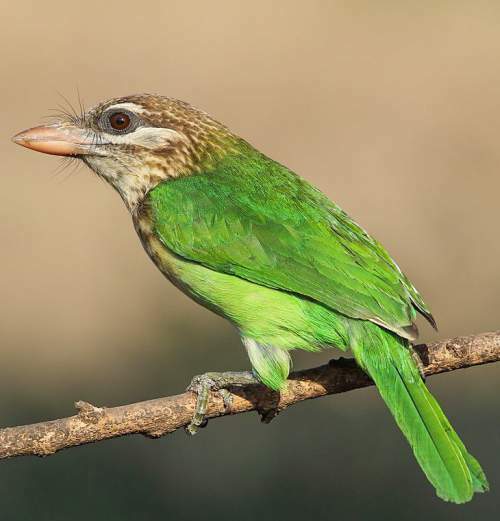 The CITES (Convention on International Trade in Endangered Species of Wild Fauna and Flora) status is ‘Not Evaluated’ for white-cheeked barbet (Psilopogon viridis). The white-cheeked barbet (Psilopogon viridis) is closely related to lineated barbet (Psilopogon lineatus), large green barbet (Psilopogon zeylanicus) and green-eared barbet (Psilopogon faiostrictus). Current topic in Birds of India: White-cheeked barbet - Psilopogon viridis.